An afternoon in the life of Amitzim! A typical afternoon in the life of Amitzim involves many activities such as swimming, doing jobs around camp, going to our chugim (electives), going to dinner and having a peulat erev (night time activity). On any given day Amitzim interacts with tons of campers from all around camp. Yesterday for example, Machon (rising 10th graders), joined us for our swim lessons. These Machoners come to swim at least once a week and help out and have fun! 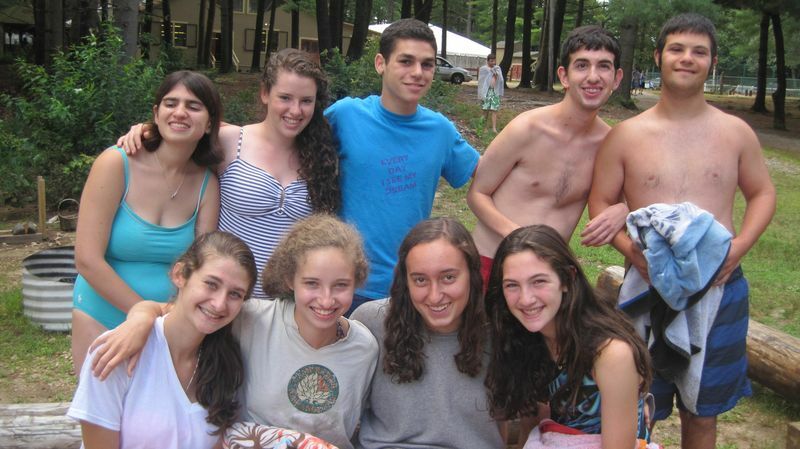 Below is a picture of some Machon and Amitzim campers hanging out at the agam (lake): This is a great opportunity for the Machon and Tikvah campers to spend time together and really get to know one another. As the day continued we ended with a special medurah or bonfire, our last one of the summer! About once a week every edah in camp has a medurah where they sing, read stories, share great moments of the week, make s'mores, have a talent show and more! At our medurah last night we had visiting singing specialists come to sing with us, we made delicious s'mores, read some stories and reflected on the summer. Here are some great pictures from around the fire. Enjoy!